Get instant savings by purchasing a Cannes travel package. Just pick out your favourite options and let Expedia take care of the rest. Book now on Expedia and earn savings of up to 15%*! It's really that easy! You don't need to search different websites to secure your travel bookings. With more than 400 partner airlines and 321,000 properties worldwide, our comprehensive database has got all that you need. Almost all bookings can be changed with no extra charge from us. Getting ready to take off on your Cannes holiday? Not sure what sort of things to add to your travel programme? Don't stress — we're here to give you a few pointers. As you roam around delighting in the city's sights and sounds, be on the lookout for the La Croisette and the Palace of Festivals and Congress Hall. These well-known attractions will no doubt be one of the highlights of your day. Fort Royal protected the region from invasion for generations. Explore this time-worn structure and discover the stories behind its walls. There's an excellent range of things to keep you busy in this destination. Elegant decor, dazzling lights and confident croupiers are some of the things you'll encounter at Casino Palm Beach. Meander around the gaming tables or just relax with a cocktail in hand and soak up the atmosphere. Still have time to spare? Many major policies have been thrashed out at Cannes City Hall. Take it in from afar or close up on an open day or a tour. A holiday is a fantastic time to chill out and relax. It's also the perfect time to try new things! For the entire list of options, take a look at our Cannes things to do page. There's nothing better than kicking back and relaxing after a long day of activities. There are approximately 242 accommodations in Cannes, so finding the perfect room for your cheap holiday or luxury getaway won't be a drama. Premium options such as the O Carré Croisette (12 Rue du Batéguier) and the InterContinental Carlton Cannes (58 Boulevard la Croisette) are sure to please even the most discerning guests. Looking for somewhere more economical? The Florella Croisette (3, Place du General de Gaulle) and the Cannes Croisette Prestige (87 Rue d'Antibes) are a couple of options that won't put a dent in your bank balance. No one likes hanging out at the airport. But it's worth it when you think of the holiday waiting on the other side! Situated 13 miles (21 km) northeast of Cannes, Cote d'Azur Airport (NCE) is the most convenient terminal. On a sightseeing tour of the city’s elegant waterfront, visit the governmental seat of Cannes to admire the building’s elegant symmetry and neoclassical design. Relax in the sun on a thin strip of sand in Cannes, away from the glitz of shopping and being seen in this famous resort city. Wander around a historic fort on an island off the coast of Cannes and enter cells that once held famous religious and political prisoners. Discover the remains of shipwrecks, encounter beautiful underwater creatures and marvel at Roman artifacts in a museum dedicated to marine archaeology. 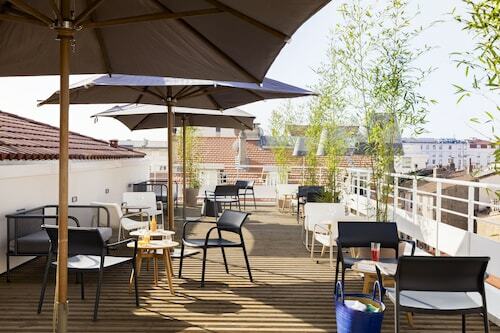 This family-friendly Cannes hotel is located near the boardwalk, just steps away from Rue d'Antibes and La Croisette. Cannes Harbour and Sophia Antipolis are also within 3 miles (5 km). Cannes Station is only a 4-minute walk. Located in Cannes City Centre, this beachfront hotel is in the city centre and within 1 mi (2 km) of Rue d'Antibes, La Croisette and Cannes Harbour. Mace Beach and Palace of Festivals and Conferences are also within 15 minutes. Cannes Station is 16 minutes by foot. 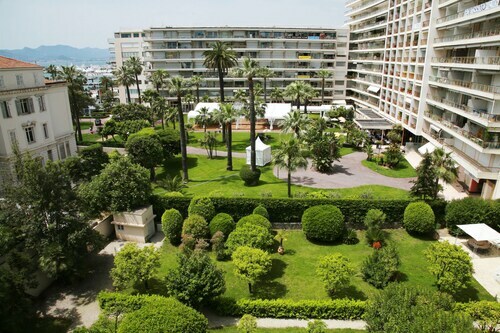 Located in Cannes City Centre, this hotel is within a 10-minute walk of Rue d'Antibes, La Croisette and Cannes Harbour. Carnot Boulevard and Palace of Festivals and Conferences are also within 5 minutes. Cannes Station is only a 1-minute walk. 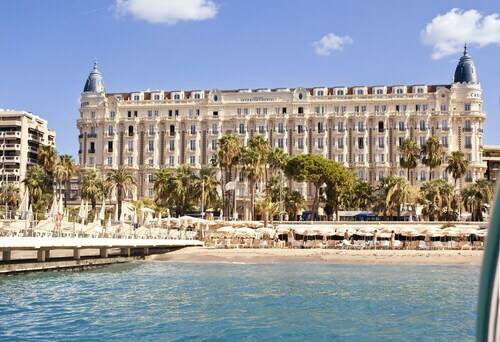 Located in Cannes City Centre, this luxury hotel is steps away from Mace Beach and La Croisette. Cannes Harbour is 0.6 mi (0.9 km) away. Cannes Station is 11 minutes by foot. This family-friendly Cannes hotel is located by the sea, within a 5-minute walk of Rue d'Antibes and La Croisette. Cannes Harbour is 0.3 mi (0.5 km) away. Cannes Station is only a 4-minute walk. Offering direct access to the beach, this Cannes Old Town hotel is in the historical district and within a 15-minute walk of Palace of Festivals and Conferences and La Croisette. Juan-les-Pins Beach and Picasso Museum are also within 9 mi (15 km). Cannes Station is 14 minutes by foot and Cannes-la-Bocca Station is 27 minutes. Located in Cannes City Centre, this residence is steps away from Rue d'Antibes and La Croisette. Cannes Harbour is 0.7 mi (1.1 km) away. Cannes Station is 12 minutes by foot. Located in Cannes City Centre, this beachfront hotel is in the city centre, just steps away from Mace Beach and La Croisette. Cannes Harbour is 0.6 mi (1 km) away. Cannes Station is 13 minutes by foot.